The day my friend died. That day is on the list–you know, the list we all pack around. The personal list of the days that sink into your core, the days you will remember for a long, long time. Days like 9/11 and the day the Broncos won the Super Bowl for the first time. Bad and good. Burned deep. Days to remember when you are old and worn and pooing in your own britches and eating soft food. So the day my friend died. Here’s another one–the day his family asked me to take his dog. His name–the dog’s–is Duke. 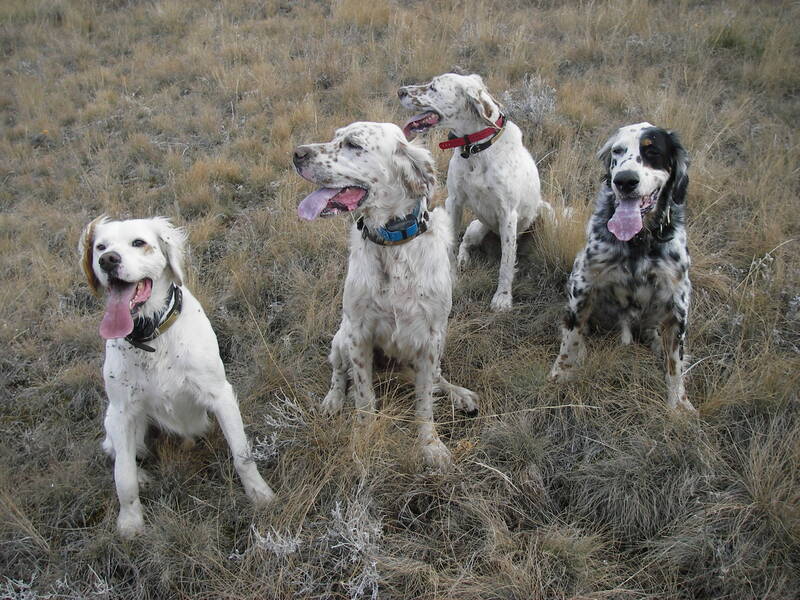 My friend had three dogs, two Brittanies and a setter. I’m a setter man. Three were already at home, a team of setters that sweep the country and miss little. A fourth? Really? A fourth? There would be no bird safe from here to Great Falls with that kind of canine vacuum power. Four? I gave it about three minutes’ thought. Yes, four. I’d do it for my friend, but I’d do it for Duke too. He came home with me in October, a thin high October with filtered light from the sky and a vast stretch of partridge prairie out before me. 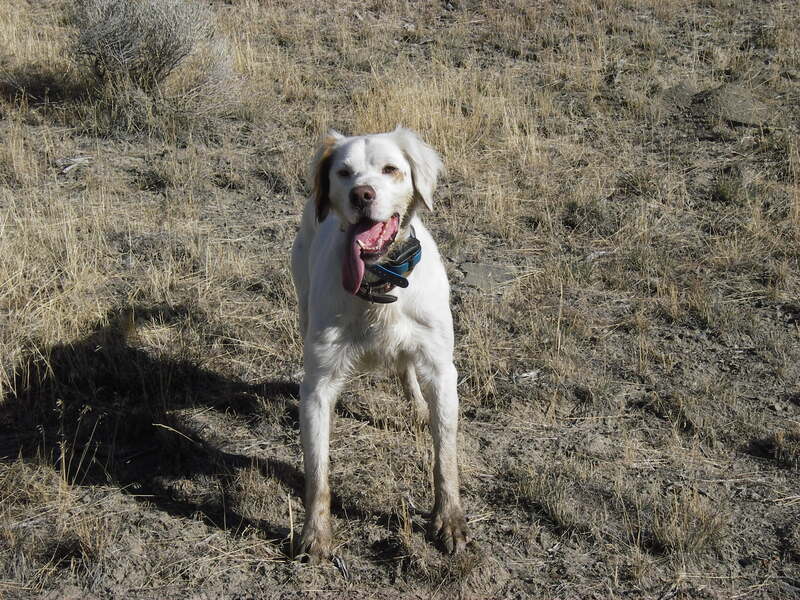 He was out of shape and a little overweight, which for a setter is about one pound. But he had fire. I had seen him hunt and I knew it was there and that he’d burn hot and long and get it done. 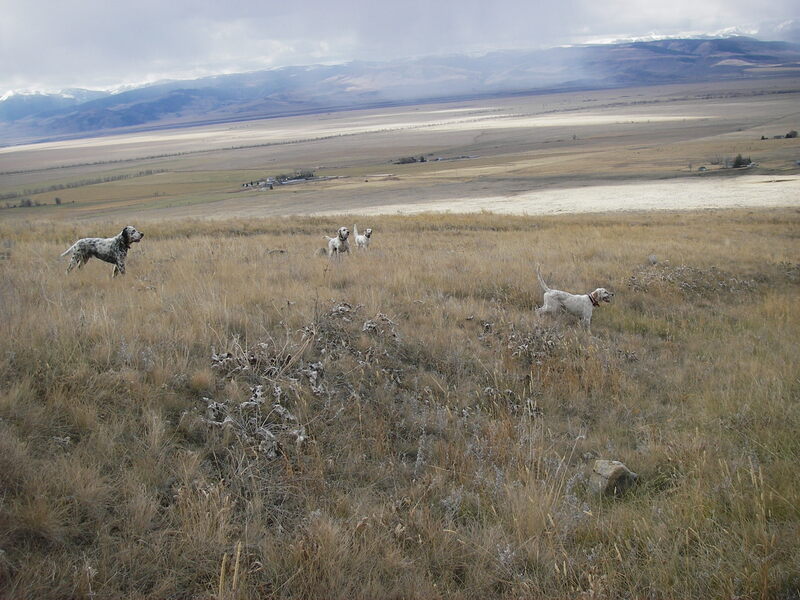 And so it was and then all four dogs were out on the ground–a huge canvas of grays and browns and four white setters dancing across it like notes on sheet music. Glory. They swept out into a southward Montana wind and spun in it. The original three following each other and swapping leads and going cautious when birdy. Why would I screw that kind of a trio up with a fourth? And then I saw him, off left. Tail high noon. Stunned. Stopped cold. The trio did not see him and I loped his way and called to them and then they saw him and all three honored, then one moved ahead, stealing the point. Poor form. I spoke and she stopped then and there it was–four frozen. The frozen four. The covey went up and the shotgun barked and a hun was there. Down and Duke on it. Very nice, and beautiful last photo! Awesome – really fantastic subject. I’m going to write about it too!! Setters: there’s always room for one more. Awesome blog, BTW, top notch! Great writing, great pics, great looking dogs. Great stuff man…top shelf. The pic with all 4 on point is magazine cover material. It doesn’t get any better than that, really.